New Years resolutions never work for me, not that I try very hard. To me, 1st January is another day, like any other when it comes to working out aims. I think that to make changes needs a complete attitude shift, not the passing of another year. I reserve the right to change that as more years pass! I do think though, that the end of a year is a good time to look back and decide what you’ve done well and badly. What can you learn and what you can forget. After any trip away backpacking or travelling I try and look at what I took, what I used and what I didn’t. Then, the next time I go away I can pack what I need and carry less baggage. I think it was Robert Schuller who said “you can often measure a person by the size of his dreams”. I never know whether that is the bigger the person the bigger the dreams or, the bigger the person the smaller the dreams. I always think of the dry smiles that asking kids what they’ll be “when they gorw up” gets from adults. If a kid says they want to be a Prime Minister do we measure the differently to a kid that wants to be a carpenter? I think most people dismiss those dreams, but they may inspire the kid. New Years Day to me is about carrying less baggage for the coming Year- Let me dream in peace but measure my achievements. Happy New Year! 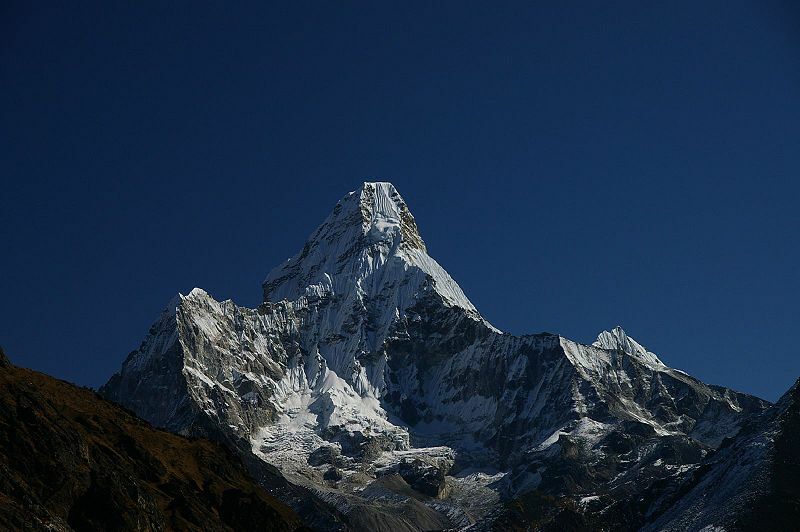 Ama Dablam was the mountain that I first dreamt of climbing.